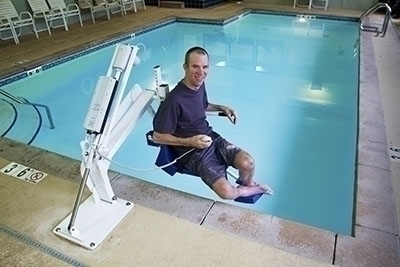 The original Pro Pool Lift is an ADA compliant specialty pool product used to provide handicap access in aquatic therapy and residential/commercial water recreation. 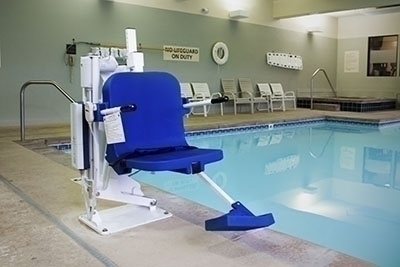 In addition to a low-profile design, this lift does not intrude into the pool when not in use. This lift now comes standard with an adjustable seat pole. This new feature now allows you to adjust the seat from 18" up to 23" making lateral transfers from higher wheel chairs easier. Several versions are available, including our deep draft configuration, which provides access to deeper pools. Reverse configuration and extended base options are available for pools with larger gutters. Try our new quick attach anchor kit and transport cart to make removing and storing your lift easy. 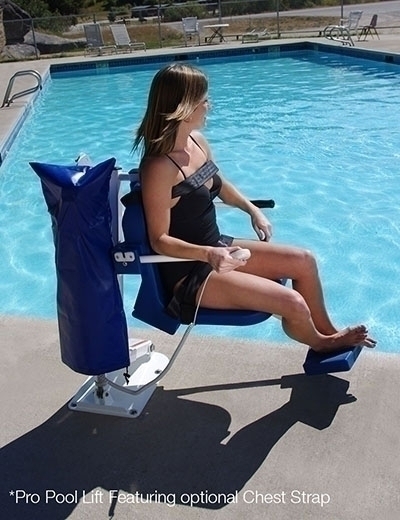 There are many featured upgrades and accessories specially designed for the Pro Pool Lift. These products are designed to keep the lift in excellent operating condition longer than any other lift of its class on the market. Dimensions: 32.72" x 43.19" x 23.27"